The alleged incident stemmed from a man asking the pregnant rapper for an autograph, according to reports. 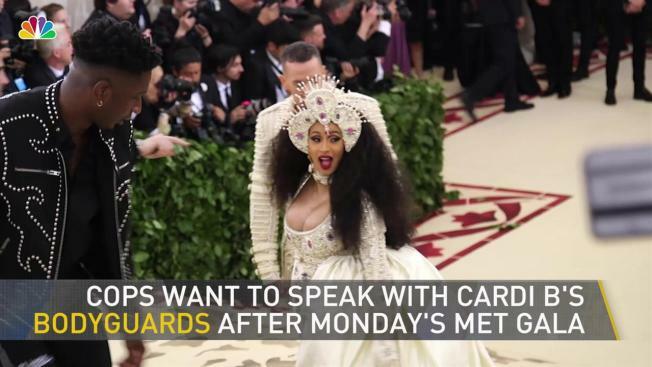 The NYPD is looking to talk to Cardi B's bodyguards in connection with an alleged attack on an autograph-seeker outside the Mark Hotel following Monday night's star-studded Met Gala, law enforcement sources familiar with the investigation tell News 4. Cops responding to a 911 call of an assault around 2:15 a.m. Tuesday were told the autograph-seeker had approached the pregnant rapper outside the hotel, and the individual and Cardi B's entourage started arguing, the sources say. "'Come on, don't be like, that, mama,'" the autograph-seeker is heard in a video telling Cardi B when she ignored his request. At some point, the argument turned physical. There was shoving and the autograph-seeker was pushed to the ground, according to the sources. Cardi B and her entourage left the scene and the autograph-seeker was taken to a hospital in stable condition. The person is expected to be fine. Missed Monday's star-studded Met Gala? Catch up on some of the extreme outfits celebrities wore to the 2018's dinner, featuring looks modeled after the 2018 spring exhibit, "Heavenly Bodies: Fashion and the Catholic Imagination." Daniel S. Szalkiewicz, an attorney for the victim, sent a statement to News 4 Tuesday, saying, "Our client was beaten to a pulp for requesting an autograph... The videos clearly show this was not an act of self-defense. The assailants fled the scene to avoid being arrested for their savage attack. No fan should ever be treated in this manner and words never justify violence." No charges have been filed in the case at this time, but the sources tell News 4 police do want to speak with the witnesses close to Cardi B, who showed off her baby bump at the gala earlier in a pearl-drenched gown and headdress by Jeremy Scott. The "Bodak Yellow" singer long kept her pregnancy under wraps, debuting her bump on "Saturday Night Live" and then announcing on Instagram late last month that she'd cancel upcoming performances to focus on her pregnancy. Cardi B was scheduled to perform at music festivals through July, including JMBLYA Festival in May and New York City’s Panorama Festival in July.